Jon Rahm is a up and coming PGA star, and you should take a close look at Ron Rahm grip. 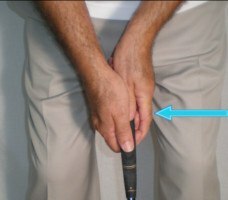 Rahm has used outstanding golf grip fundamentals to his advantage like shooting 4 rounds in the sixties at the BMW Championship 69-68-65-67. Rahm has 2 Ben Hogan Awards in 2015 and 2016 to his credit. He also won the Farmers Insurance Open on the PGA circuit. Rahm has no ball striking weakness both with the driver and irons. Tee to green is very strong. So how does Jon grip his golf clubs? Rahm uses a interlocking grip style for woods and irons giving him both control and accuracy. 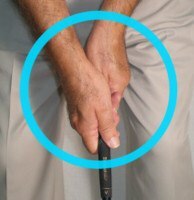 Jon uses a neutral hand position to help prevent hooks and slicing with his driver, fairway woods and irons. 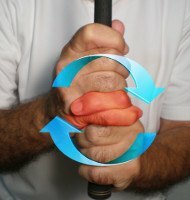 Jon uses the the very popular reverse overlap putting grip style to help keep the hands out of his putting stroke. Jon Rahm at a very young age seems to be on track to a very interesting and long PGA career.